This book was published in January 2017, ten days before the Trumps moved into the White House. The contributors, including Ava Duvernay, Brittney Cooper, and Roxane Gay, did not fully grasp when they were writing their essays how much they would miss the FLOTUS with the Mostest. I'm a MO fan myself. 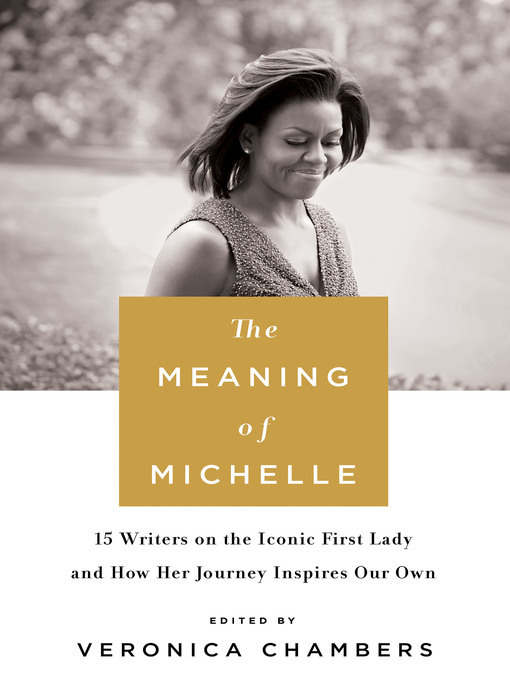 It's hard not to have a crush on her for all the reasons the book's chapters lay out, particularly her poise, her Blackness, and her arms. James Baldwin knew [this reach toward confidence in our belonging], and it is why he once wrote that he hoped future generations of Black Americans would remember "your crown has been bought and paid for. All you have to do is wear it." Thank you, Michelle Obama, for showing us how to wear it. She was the real life version of the characters Angela Bassett and Gina Torres have spent the last decade of their careers playing. The mutual girl crush that Michelle Obama and Beyoncé share is a serendipitous study in twenty-first-century Black girlhood, womanhood, and ladyhood. I saw [Obama is not here for simple-minded queries...] back in 2007, when "60 Minutes'" Steve Kroft asked if she feared for her husband's safety as a presidential candidate, Michelle Obama looked dead in the camera: "The reality is that as a Black man, Barack can get shot at the gas station."